A chip developed by mechanical engineers at Worcester Polytechnic Institute (WPI) can trap and identify metastatic cancer cells in a small amount of blood drawn from a cancer patient. The breakthrough technology uses a simple mechanical method that has been shown to be more effective in trapping cancer cells than the microfluidic approach employed in many existing devices. A close-up of a prototype liquid biopsy. 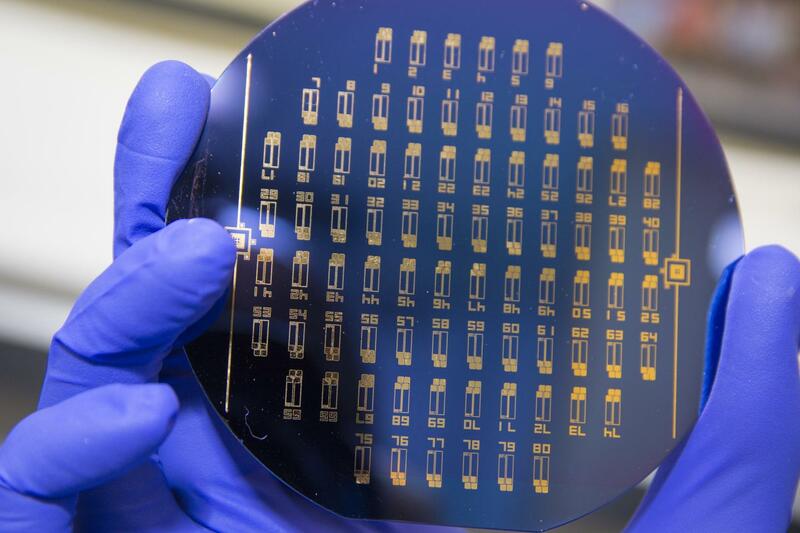 The chip is able to capture circulating tumor cells in a very small sample of blood. Etched into it are 76 individual test units, each with a small well containing antibodies for specific cancer cell surface markers attached to carbon nanotubes. Credit: Worcester Polytechnic Institute (WPI). The WPI device uses antibodies attached to an array of carbon nanotubes at the bottom of a tiny well. Cancer cells settle to the bottom of the well, where they selectively bind to the antibodies based on their surface markers (unlike other devices, the chip can also trap tiny structures called exosomes produced by cancers cells). This "liquid biopsy," described in journal Nanotechnology, could become the basis of a simple lab test that could quickly detect early signs of metastasis and help physicians select treatments targeted at the specific cancer cells identified. Metastasis is the process by which a cancer can spread from one organ to other parts of the body, typically by entering the bloodstream. Different types of tumors show a preference for specific organs and tissues; circulating breast cancer cells, for example, are likely to take root in bones, lungs, and the brain. The prognosis for metastatic cancer (also called stage IV cancer) is generally poor, so a technique that could detect these circulating tumor cells before they have a chance to form new colonies of tumors at distant sites could greatly increase a patient's survival odds. "The focus on capturing circulating tumor cells is quite new," said Balaji Panchapakesan, associate professor of mechanical engineering at WPI and director of the Small Systems Laboratory. "It is a very difficult challenge, not unlike looking for a needle in a haystack. There are billions of red blood cells, tens of thousands of white blood cells, and, perhaps, only a small number of tumor cells floating among them. We've shown how those cells can be captured with high precision." The device developed by Panchapakesan's team includes an array of tiny elements, each about a tenth of an inch (3 millimeters) across. Each element has a well, at the bottom of which are antibodies attached to carbon nanotubes. Each well holds a specific antibody that will bind selectively to one type of cancer cell type, based on genetic markers on its surface. By seeding elements with an assortment of antibodies, the device could be set up to capture several different cancer cells types using a single blood sample. In the lab, the researchers were able to fill a total of 170 wells using just under 0.3 fluid ounces (0.85 milliliter) of blood. Even with that small sample, they captured between one and a thousand cells per device, with a capture efficiency of between 62 and 100 percent. The carbon nanotubes used in the device act as semiconductors. When a cancer cell binds to one of the attached antibodies, it creates an electrical signature that can be detected. These signals can be used to identify which of the elements in the array have captured cancer cells. Those individual arrays can then be removed and taken to a lab, where the captured cells can be stained and identified under a microscope. In the lab, the binding and electrical signature generation process took just a few minutes, suggesting the possibility of getting same-day results from a blood test using the chip, Panchapakesan says. In a paper published in the journal Nanotechnology, Panchapakesan's team, which includes graduate students Farhad Khosravi, the paper's lead author, and researchers at the University of Louisville and Thomas Jefferson University, describe a study in which antibodies specific for two markers of metastatic breast cancer, EpCam and Her2, were attached to the carbon nanotubes in the chip. When a blood sample that had been "spiked" with cells expressing those markers was placed on the chip, the device was shown to reliably capture only the marked cells. In addition to capturing tumor cells, Panchapakesan says the chip will also latch on to tiny structures called exosomes, which are produced by cancers cells and carry the same markers. "These highly elusive 3-nanometer structures are too small to be captured with other types of liquid biopsy devices, such as microfluidics, due to shear forces that can potentially destroy them," he noted. "Our chip is currently the only device that can potentially capture circulating tumor cells and exosomes directly on the chip, which should increase its ability to detect metastasis. This can be important because emerging evidence suggests that tiny proteins excreted with exosomes can drive reactions that may become major barriers to effective cancer drug delivery and treatment." "White blood cells, in particular, are a problem, because they are quite numerous in blood and they can be mistaken for cancer cells," he said. "Our device uses what is called a passive leukocyte depletion strategy. Because of density differences, the cancer cells tend to settle to the bottom of the wells (and this only happens in a narrow window), where they encounter the antibodies. The remainder of the blood contents stays at the top of the wells and can simply be washed away." "Imagine going to the doctor for your yearly physical," he said. "You have blood drawn and that one blood sample can be tested for a comprehensive array of cancer cell markers. Cancers would be caught at their earliest stage and other stages of development, and doctors would have the necessary protein or genetic information from these captured cells to customize your treatment based on the specific markers for your cancer. This would really be a way to put your health in your own hands." Citation: Khosravi, Farhad, Patrick J. Trainor, Christopher Lambert, Goetz Kloecker, Eric Wickstrom, Shesh N. Rai, and Balaji Panchapakesan. "Static micro-array isolation, dynamic time series classification, capture and enumeration of spiked breast cancer cells in blood: the nanotube–CTC chip." Nanotechnology 27, no. 44 (2016): 44LT03. Adapted from press release by Worcester Polytechnic Institute.